A relatively new specialty, the clinical nurse leader (CNL) is a master's level educated nurse who is focused on improving the quality of care for a specific set of patients. Working together with a multi-disciplinary team of physicians, pharmacists, social workers, clinical nurse specialists and nurse practitioners, the clinical nurse leader collects and evaluates treatment results and works to improve those outcomes by advocating for evidence-based change. Unlike the clinical nurse specialist, the clinical nurse leader has an advanced knowledge in general medicine as opposed to one primary discipline, and often manages other nursing staff and serves as a resource to the entire care team. Why Are Clinical Nurse Leaders So Important? Clinical nurse leaders make it their mission to identify ways to improve the quality of patient care by consistently evaluating patient outcomes, assessing cohort risk, changing care plans, advocating for change and mentoring fellow nurses. While other nurse leadership positions may focus on managerial or administrative tasks, the clinical nurse leader focuses on patient care. In addition, a core principle of the clinical nurse leader role is identifying and implementing methods for reducing healthcare costs for the institution. In fact, as part of their 2015 survey of certified CNLs, the Commission on Nurse Certification found that the majority of clinical nurse leaders report often suggesting a cost-saving idea or process that improves institutional efficiency. RNs interested in becoming clinical nurse leaders requires strong problem solving and critical thinking skills, which are needed in evaluating patient results and making strategic changes to improve the quality of care for their patients. Unlike other leadership positions, the clinical nurse leader is a patient-facing role, so nurses should enjoy working with patients as well as mentoring their fellow nurses. A relatively new specialty, clinical nurse leaders have the opportunity to shape a new career in nursing. What Are the Educational Requirements for Clinical Nurse Leaders? The clinical nurse leader is an advanced clinician with education at the master's degree level. Graduate level education is necessary because the CNL must bring a high level of clinical competence and knowledge to the point of care and also to serve as a resource for the entire nursing team. The MSN degree will prepare nurses for this advanced role. In order to earn an MSN degree, nurses must first complete their Bachelor of Science degree and pass the NCLEX-RN exam. RNs may then advance to a Master's of Science Clinical Nurse Leader program, in which they will take advanced courses in pathophysiology, clinical assessment and pharmacology. The final step in becoming a clinical nurse leader is obtaining the CNL certification from the Commission on Nurse Certification. Find a clinical nurse leader program. Requirements for clinical nurse leader MSN programs vary from school to school. The American Association of Colleges of Nursing lists the schools currently offering a clinical nurse leader MSN degree program. These schools offer a variety of program options, including online and traditional in-person classroom programs, as well as full-time and part-time courses of study. Most clinical nurse leader positions require a Clinical Nurse Leader Certification, offered by the American College of Colleges of Nursing's Commission on Nurse Certification. Eligibility requirements for this certification include an active RN license and completion of a master's or post-master's degree program in nursing with a focus on the clinical nurse leader role. Read more about clinical nurse leader programs. A clinical nurse leader focuses on improving the quality of patient care outcomes. They work together with a patient's entire care team to collect and analyze treatment results, assess risk, stay up-to-date on the latest technologies and treatment innovations and then incorporate that knowledge into improved systems for patient care. Clinical nurse leaders become team leaders, educators and advocates for patients, continually seeking new ways to improve patient outcomes. To search and apply for current clinical nurse leader positions, visit our job boards. What Are the Roles and Duties of a Clinical Nurse Leader? There are a number of settings in which clinical nurse leaders work, including hospitals, private clinics and acute care institutions and research facilities. They may also work as nursing educators in medical colleges, where they develop and implement educational programs aimed at improving the quality of patient care. An emerging advanced nursing role, there is a significant demand for certified clinical nurse leaders who will improve patient safety and outcomes while providing cost-efficiency measures and nurse leadership for the institution. Clinical nurse leaders can expect a median salary of around $75,000, with a range of $50,975 - $100,094. Geographical location is the biggest factor impacting a clinical nurse leader's salary, followed by career length and experience level. While a fairly new specialty, many healthcare employers seek clinical nurse leaders who can create new policies and procedures to improve patient outcomes. 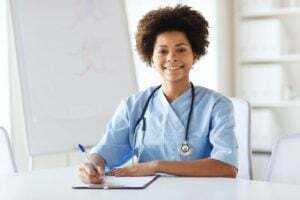 Further, an increasing number of healthcare facilities are looking for nursing professionals with higher degrees, which means the demand for nurses with this type of education, including the clinical nurse leader, will likely rise.